It’s summertime! The kids are out of school and it’s hot outside, and that usually means higher home costs. If you have kids living at home, you know that during the summer months when they are out of school, they not only raise your food bill, but they also use a lot more electricity than during the school year. The good news is there are simple things you can do to help combat those costs! Take a look at these tips to keep you cool and collected this summer. Did you know that your air conditioner is one of the biggest pulls of electricity in your home? When it is hot and sunny outside, perhaps the simplest way to save money is to close the blinds and curtains in your house. This will keep the sunlight from warming your home too much and making your air conditioner work overtime. This easy method could end up saving you big time on your electric bill this summer. Believe it or not, there are appliances and other items in your home that use electricity even when you aren’t using them. Ever wonder how the clock stays running on your cable box, stove, coffee maker, etc.? Even though you aren’t using these appliances all the time, they are still using electricity to run the clocks and maintain your settings. A charger of any kind still plugged into the wall pulls electricity even when you aren’t charging anything. Obviously, the easiest way to stop this is to unplug your devices from the wall when not in use. Even if you don’t want to unplug the TV or cable box, you can still make sure all chargers aren’t plugged into the wall. Keeping the heat out of your home during the hot summer months is not only pleasing to your body, but is good for your wallet. Like closing the curtains, not using your stove or clothes dryer very often during hot periods can help keep your electric bill at bay. Air dry your clothes and cook meals that don’t require you to use your stove. Both appliances heat the house more than you would think while they are in use. This makes your A/C kick it up a notch to try to combat the heat, and the results show up on your electric bill. So you can see that these tips are extremely basic and easy. It’s crazy to think how just small bits of energy conservation can add up to a big difference on your electric bill. 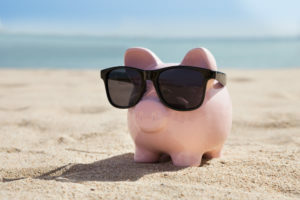 Doing these tips regularly will be very helpful in your quest to combat the rising costs of summer.